From 20-22 April 2017, Navdanya joined Peliti at the Olympic Seed Freedom Festival, along with people and organisations from all over the world to join forces to sow the seeds of the future and sow the seeds of another vision for the planet and its inhabitants. This 2017 Seed Festival is part of the global mobilization which culminated with the People’s Assembly and the Monsanto Tribunal in the Hague last October, co-organised by Navdanya, along with multiple civil society organisations. The program schedule saw two days of intense capacity building workshops: Working together towards a GMO-Free, Pesticide-Free, Corporate-Free future, Situation of traditional varieties in the US, Situations and strategies for Food Sovereignty in Africa, Seed Festivals and Seed Savers Networks Worldwide, European Legislation on Seeds. Among the participants in both the workshops and the festival: Navdanya International, Ali Tapsoba, Terre à Vie – Burkina Faso, Shannon P. McCabe, Baker Creek Heirloom Seeds – USA, Father Gedeon, Monastery Agia Triada – Turkey, Matthieu Le Breton, Faucheurs Volontaires d’OGM – France, Mr Noufou, Federation Nationale des Groupements NAAM – Burkina Faso, SAVEGEA – Cyprus, Hannes Lorenzen, Agricultural Expert senior agricultural advisor at the European Parliament, Blanche Magarinos-Rey, lawyer and expert on seed issues. 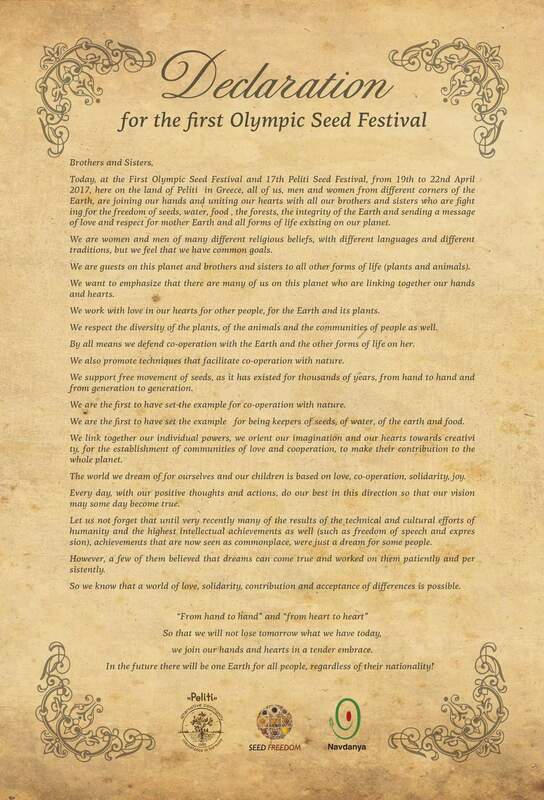 The working group launched a Declaration at the Festival, which saw more than 4000 people, consisting of farmers, seed savers, gardeners and citizens from all over Greece and Europe. Along with the Greece Minister of Agricuture Mr. John Tsironis, thousands of paritipants visited the stand of Navdanya to join the Seed Freedom and other ongoing Campaings, also by signing the Declaration on Seed Freedom and the Citizens’ Pact for the Earth. This year – as in previous years – this event represented a unique opportunity to build connections and strengthen the movement to shape Food Systems that produce more food, better food, more livelihoods, more meaningful work, more democracy, more freedom. Movements across the world have joined this renewed “Call to Action against the Corporate Takeover of our Food and Health” and events and actions have taken place along the month of April and will continue beyond. Opening the 1st Olympic Seed Festival!#peliti #seedfreedom #workingtogether towards #gmofree #pesticidefree #corporatefree future #AliTapsoba: Our strategy is IMA, Information, Mobilization, Action. We need personal and socially connected engagement towards agroecology in order to face the danger of GMOs and corporate control on our health and environmental policies and on our cultural society. One Comment to "Olympic Seed Freedom Festival – Highlights"